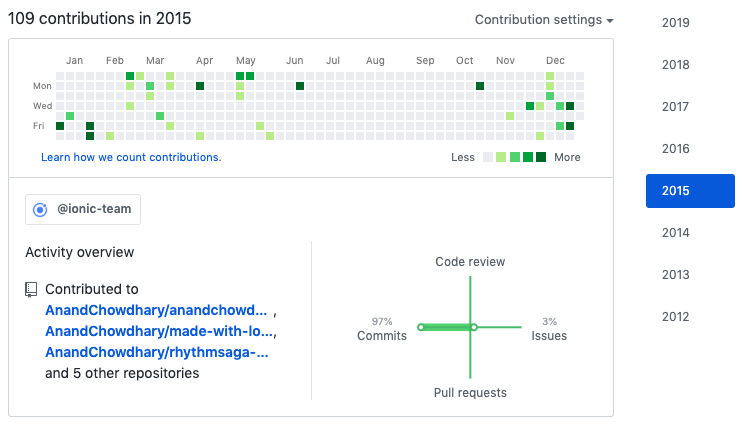 The number of contributions I’ve made on GitHub has increased by over 20x in the past few years. 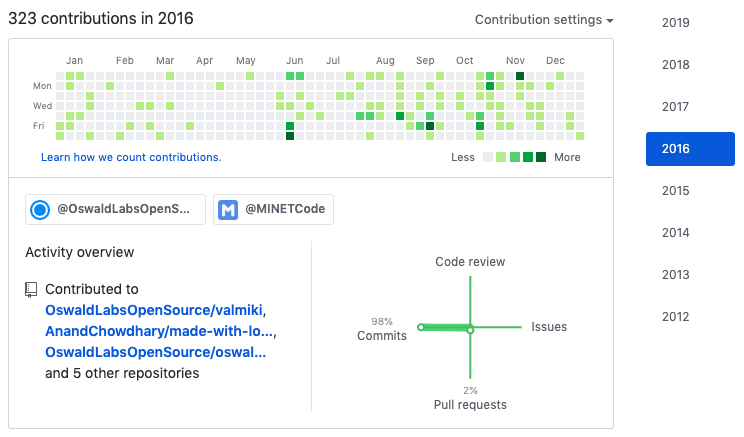 In 2015, I made slightly more than 100 contributions. These were mostly on my own projects, like my personal website, Made with Love in India, and Saga Music. This is still less than 2014 (when I made a few projects centered around CSS and WordPress), but it’s still something. 2016 was better, with more than twice the number of contributions. This is also when I founded Oswald Labs, so some of that work went into building our websites and first open-source extension. 2017 was even better with 465 contributions. In the first half of the year, I was working full-time on Oswald Labs (along with some freelance projects), and moved to Enschede in the second half. I also participated in (and won!) two hackathons, whose projects I also open-sourced. Oswald Labs mostly worked on GitLab, so there are (scattered) contributions here and there. 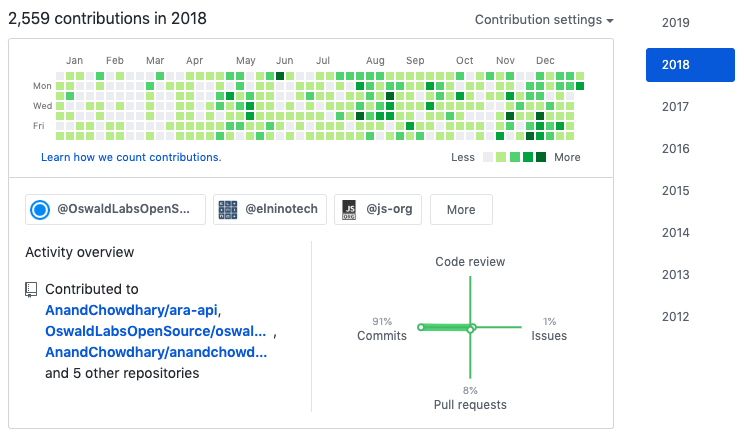 Last year is when there was a substantial, 6x increase in my open-source work. 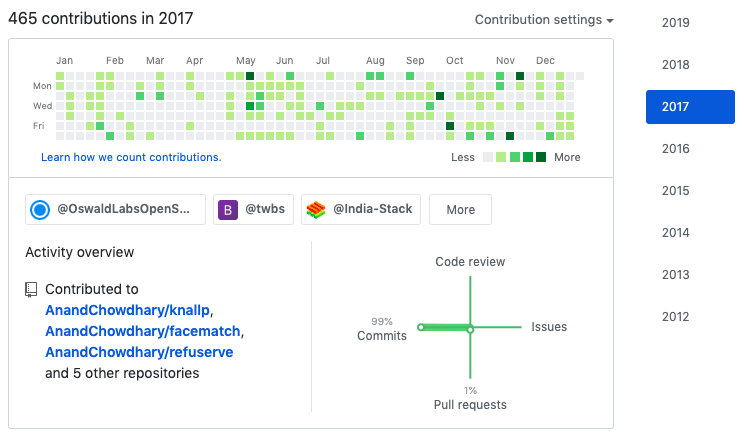 With over 2,500 contributions, this was the first time I was in four-figures, and my work was mostly on personal projects and a few libraries. Finally, as of the first quarter of this year, I already have over 1,500 contributions. 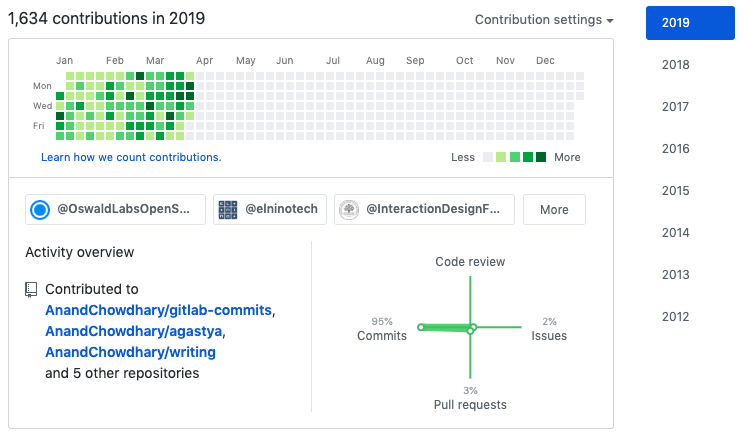 These are split around both Oswald Labs and my personal projects, and I also made a system to count my GitLab commits. At this rate, I should hit 5,000 this year (thought I don’t know how long I can keep this rate up). These are the projects I’ve built in the first quarter of 2019. In this section, I’m counting a little bit of December 2018 and a few days in April 2019 as the first quarter too, because I started some projects a few days before 2019 began, and finished one a day in April. Itch: For a hackathon project, my team and I made Aristotle, an e-learning system. For this, I wanted a way to show Wikipedia summary cards for important terms. Itch: The Hello Bar service is expensive, and Oswald Labs needed a way to show targeted announcement bars with important information to visitors. Around this time is also when I learned TypeScript, so the projects after late-January are not in ES6. Itch: For an AI scheduling assistant I’m working on, I wanted a way to send platform-agnostic calendar invitation links. Itch: It’s hard to translate JSON files using Google Translate, especially if they have nested items. However, this is a necessity if you can’t afford to pay human translators and still need localization. Itch: With me making so many DOM libraries in TypeScript, I wanted a easy-to-use, no-configuration starter with didn’t have tons of boilerplate code. Itch: I wanted a plugin to show users the most recent updates and features on Agastya’s admin panel. Itch: I wanted to build a Twitter bot (never did that before), and also wanted to curate a timeline related to accessibility. Itch: The MIT license is great, but I wanted to add values like privacy to it, to ensure that my code isn’t used for evil. Itch: MongoDB is an overkill for simple key-value storages, and I wanted a git-based backup system to store and manage Oswald Labs’ developer API keys. Itch: I wanted to write my honors research proposal, but on GitHub with auto-saving. Itch: I wanted to share links to my favorite podcasts with my friends, but didn’t know which podcast player they prefer. Itch: Many websites these days want to embed tiny live chat or support widgets to their websites, and most of them live in iframes. I wanted a starter for that. Itch: In macOS Mojave, users can choose their preferred color scheme (dark or light), and I wanted a way to see which theme a user has selected. Itch: I want to backup my phone’s photos, but to my own S3 instance because I’m afraid to lose them (I already pay for Google Photos, but I’m paranoid about data loss). Itch: Flags aren’t good icons for languages. For example, should I use the US or the UK flag? Why not Pakistan’s? They have more English speakers than the UK. I made the most contributions I’ve ever made (per day) in the first quarter of 2019. I learned a lot (like TypeScript! I love TypeScript!) this quarter too, so it was a great start to an important year. Of course, the number of contributions is not a great way to measure impact. It depends on how much code is in each commit, and how much it’s truly adding to the open-source community. But, all in all, I’m happy with the way things are going and hope to continue to do my small part to build the ecosystem.